The next session begins April 23, 2019 at The Barking Lot, 495 Lake Cook Road, Deerfield, IL 60015. $120 per 6-week session for non-members; $50 per session or $10 per night for members. Half-price for a second dog (same family) or a second class (same dog). Call Hope or Fran 847-677-0680 days or 847-674-8613 evenings for more information or to reserve a space. Everyone must complete a new Training Waiver the first week of class for the year, and new students must complete a Training Waiver for their first class. Print out and complete the Training Waiver. Bring it to class the first night and give it to the Registrar. You'll need Acrobat Reader (a free, downloaded program) to open the file: training_waiver.pdf. The Barking Lot is a day care, boarding facility and store. We are very fortunate to have found such a beautiful home for our classes, and encourage everyone to Get Training! Call 847-677-0680 for more information. Puppy / Beginner Class is the start of your adventures in training! Get ready to have fun with your dog, learning the basics. 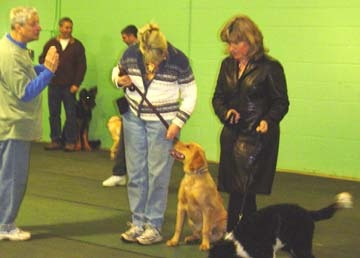 Rally Obedience Class is a stepping stone to the path of competition and also challenges dog and handler. Rally offers dog and handler fun and excitement, moving along a preset course of designated stations. Each station provides instructions for the skill to be performed. Our volunteer instructors are experienced competitors in the Rally ring. 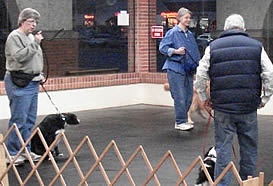 Novice Obedience Class is the first step on the road to competitive obedience. Our volunteer instructors are well-versed in the AKC competition rules and make sure our dog/handler teams are well-prepared the first time they step in the ring at an Obedience Trial. They can’t help with the butterflies, but they’ll make sure you face no surprises in the ring. Advanced Obedience Class is for dogs that have substantially completed their Novice (CD) title, and focuses on the exercises needed to reach the CDX (Companion Dog Excellent) title and beyond.